This is less a tutorial, and more a note following last week’s post on drawing grasslands. The result of that tutorial strongly depend upon the background texture used and I wanted to highlight that with this post. 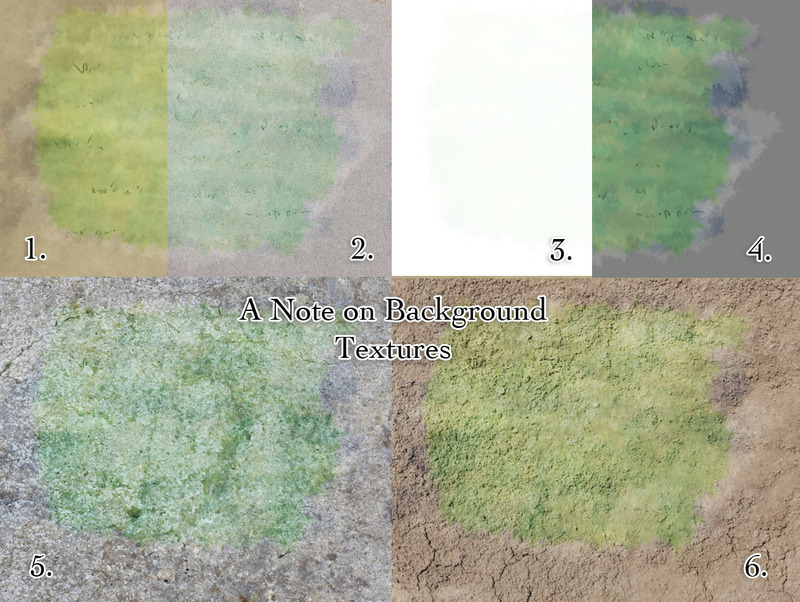 To recap, the original grass image (Panel 1 in the attached image) is a combination of four layers: 10% normal green, 100% overlay green, 100% overlay light and dark, and a final colour burn layer for the dark grass tuft details. All of these layers allow the background texture/colour to show through and the overlay and colour burn layers actually depend upon the background colour/texture for their results. So the choice of textured background is critical. Parchment – as before. Here we see the results from last week’s grassland tutorial, re-used here to provide a datum for comparison. Paper. This is a straightforward paper texture with roughy the same tone as the original parchment. You can see all the grassland, and it looks pretty nice. However the fact that the background is much less saturated than the parchment, and specifically less yellow, completely changes the feel of the grass. It could be some wintry tundra if it looked like this. White background. So here we pretty much just see the 10% normal layer. Overlay layers lighten and darken the colours beneath them. It’s not a linear relationship, meaning if you have a light background, you’re going to need a lot of dark overlay layers to build up a shadow, but a little white on an overlay layer will brighten it up quickly. If the background’s white, you’ll never get any purchase with dark overlay layers. The lesson? Make sure you’re background has a tone somewhere near the middle between light and dark (open up the Levels dialog and make sure the hump is somewhere near the middle). Here I’ve used 50% grey. So having just said that overlay layers have trouble lightening dark backgrounds, and trouble darkening light backgrounds, if the background is exactly 50% grey then light colours on overlay layers will lighten it and dark colours darken it just fine. So you can see we get a perfectly respectable result here, but the background isn’t adding anything to the image here. Rock. Here I’ve just dropped in a rock background. The colours over the top are perfectly visible as they combine well with the greys (as in 4.). However the detail on the rock overwhelms the detail in the art over the top. It’s as if we’ve ink washed a slab of granite – less a painting on the rock, and more like painted rock. The darkest shadows are coming from the texture – which is generally something you want to avoid. Earth. As with the rock texture, the texture dominates. If I were to use this, I’d lower the opacity of the earth texture so that it suggests the texture rather than shouting it. 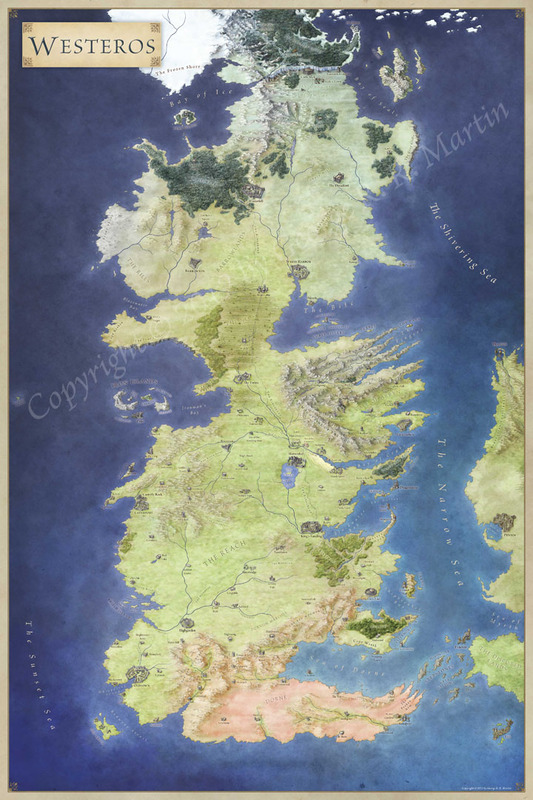 I hope that shows a few of the pitfalls and opportunities for using texture as the base for a map, and how that interacts with overlay/burn layers. Let me know if you have any questions.